I’ve been lucky to have some fantastic teachers in my short painting career so far. It all started with a four day intensive exploration of a range of media with Mark Judson which inspired me to take up watercolours in the first place. Then progressed through a series of one-to-one sessions in watercolours with Gilly Marklew, and continued with a workshop in loose colour work from Jean Haines. More recently, my foray into oils with Stephen Higton and acrylics on the workshop by Georgia Mansur, all have been inspiring and hugely knowledgeable. They’ve all be generous with their knowledge and I’ve learned so much from spending time with them. I’ve written before about my block when it comes to painting people and animals. My inspiring sister, Lori Bentley has the ability to capture the essence of a person with only a few pencil strokes. I’ve watched in amazement as she does this with deceptive ease. And I do know just how difficult it is – I’ve tried and had some embarrassingly awful failures. I showed one of these to my sister and, when we’d finished laughing, she created me an email tutorial on painting portraits. As a prelude to painting people, while we were on holiday in France, I’d plucked up the courage to try painting a frog, then I had a go at an Augrabies Flat Lizard. The portrait still eludes me but I’m getting closer. 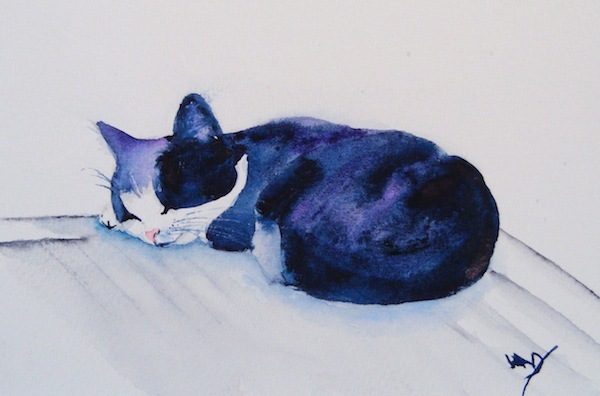 Over the summer, Lori and my fellow 100 Wash Challenge artist, Olivia Quintin met our cat Horatio and both found in him, a co-operative and enticing model for a watercolour painting. (If you’d like to have a look, here are Lori’s Horatio and Olivia’s Horatio ). This afternoon, I decided to take the leap and progress from cold blooded to warm blooded animals so I had a go at painting Horatio from a photograph taken while he slept on the garden table. Thanks to all my wonderful teachers, but in this case, particularly to Lori for her inspiration and her tutorial: people paintings coming soon, I hope. 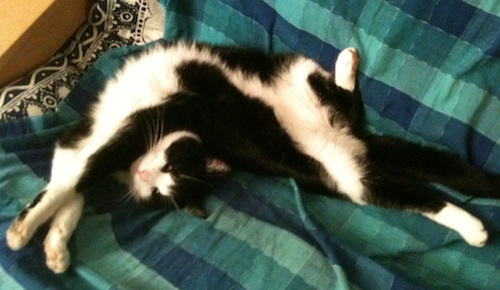 Horatio seems more comfortable sleeping in contorted positions. Flexibility supreme.